After college, Phillip Fisher shook the dust of Antioch, Indiana from his dress shoes and took off for Indianapolis. For the eldest of the three Fisher men, a business career promised stability and a fruitful future...until unemployment and exhausted resources force him back home. He returns to Antioch to find his father's declining health, a family farm in disrepair, and heavy doses of resentment from his brother Aaron. A repentant Phillip pays regular visits to Sundae Afternoon, the sweets and sundry shop run by Mila Thomas. Sundae Afternoon and the Thomas Grocery Market are staples of Antioch, just like the Fisher farm. A less than steady peace exists between the families, but Phillip always intrigued Mila. She admires his attempts to break free; at the same time, his return speaks of a noble, caring man. But what happens once the farm is restored? What happens when Phillip is called back to Indianapolis? Mila’s roots are firmly grounded, and Phillip might leave all over again. Is returning home and the discovery of an extraordinary love, enough to bring them together forever? Phillip Fisher crouched into a squat and dug his fingertips into hard, dry earth that crumbled free against the exerted pressure. He crushed the soil into his palm and then opened his hand slow, allowing particles to whisper, sift, and swirl against an arid—too arid—gust of air. His gaze moved across low-lying green leaves burnished to rich gold by the rays of a setting sun. He took in the sway and toss of underdeveloped soybean plants, and his brow furrowed. Pushing to a stand, he swiped dirty hands against a pair of well-worn jeans—the only pair he had ever allowed within the stylized, designer-laden wardrobe of his recently vacated condo in Indianapolis. He eyed the family farmhouse. An ache built deep in his chest as considerations of all he had done wrong barreled through his mind. All the figurative slaps in the face he had delivered to the ones most precious to him—the ones who remained sheltered inside the sturdy, if time-worn, walls of his childhood home. A curving breeze whispered through the beds of vegetation. Dust skimmed against his face like a stroke from God, and he knew one thing to be true. He needed to come to terms with his life. Fast. In deference to that goal, Phillip clenched his jaw and rejected further introspection. There was no time for regrets, only action. Reclamation. Don’t travel backwards when you’re trying to get to the future. Isn’t that what Pop would say? Probably. The Fisher family patriarch, Jonathan, constantly preached one nugget of wisdom after another. Nowadays, Phillip wondered why he hadn’t paid closer attention. 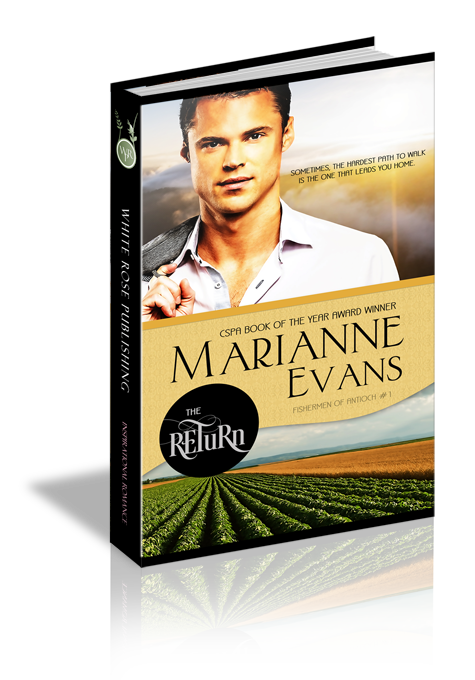 He latched his thumbs in the front pockets of his jeans as more hot air blew, tossing his hair, filling his senses with the pungent aroma of grass, fertilizer, and sunbaked earth. Without question, Pop needed help this season. All it took was a glance to realize the upcoming fall harvest would be rough. Maybe Phillip could help. Maybe he could redeem himself through hard work and dedication. In return, he hoped for nothing but the chance to begin again. He studied the farm even closer as he crossed a pathway that framed the southern boundary of their four-hundred-acre spread. Cream colored paint peeled slightly in spots. The black shingled roof, worn and patched in a few places, would need replacing sooner rather than later. The wraparound porch remained timeless and welcoming, dotted by his mother’s cheery, bright flower plants. Brown wicker chairs were angled toward the west where a flat lay of land had always set the stage for magnificent sunsets. All the same, times weren’t great. A frown pulled at the corners of his mouth, puckered his brow. He saw it all, loved it all, even as his chest swelled, because he sure hadn’t shown this farm, or his family, any semblance of that emotion over the past few years. Almost from birth, the spirit within him had striven for much more than the tiny, rural community of Antioch, Indiana could provide. A memory dance sent him reeling backwards by three years to the day he graduated college and left Antioch for the rarified, big-city realm of Indianapolis. He blocked that bitter recollection in its tracks. A resolute stride led him up wooden porch steps that creaked comfortably and then on to a screen door he opened against a protesting squeak. The door swept open. Against every ounce of doubt, uncertainty, and pain came the weathered, loving eyes of his father. And all it took was that look to make Phillip dissolve into the boy—the son—he had once been. The greeting came out gruff and thick.